butter.” As Rafael Palomino describes one of his favorite dishes he has created, my mouth waters, and suddenly I really want a skirt steak with lobster fried rice, a quail egg on top and saffron mojito sauce. As a talented chef, this is his gift: tantalizing taste buds and whetting palettes. Palomino sells thousands of pounds of skirt steak a year with the dish described above … and that’s just one dish. Palomino spreads the love throughout eight different locations, five cookbooks and NYKitchen.com—a new delivery concept in New York City. Palomino says the end goal is simply to make people happy. Palomino first stepped inside a kitchen at 17 years old, as a garde mange (salad station) at the Verve Cafe in Brooklyn Heights. “I loved it ever since,” he says. Palomino’s cooking has been widely influenced from his childhood in Bogotá, Colombia and his later travels around the world. His restaurant introduction in New York brought him the realization of his passion, and later his travels to Spain and France allowed him to work alongside culinary legends like Larry Forgione, Charlie Palmer and Michel Guèrard. 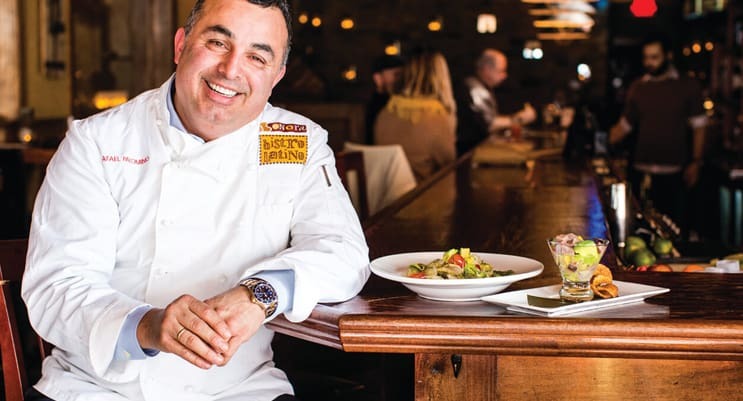 While he currently lives in New York, he has an established restaurant in New haven, Connecticut called Pacifico, which he opened 16 years ago after falling in love with the location. The concept behind Pacifico came easy enough. “Having worked in Spain and France I understood the concept of tapas very well,” says Palomino. Pacifico is an enhanced version of a previous restaurant he had and he wanted it to be about seafood, tapas and fun. Value. If you get a good value you’re going to come back. Differentiation. Something unique that you remember and is fun, if it’s fun you’re going to come back.